The common name for this species probably originated from its pupa which, when viewed from a certain angle, resembles the face of an ape. The species is quite widespread in Singapore, although it is by no means common. The caterpillars of the Apefly feed on coccids or mealy bugs, hence the butterfly appears where its caterpillar's food source is available. The species is therefore not dependent on any particular species of host plant. 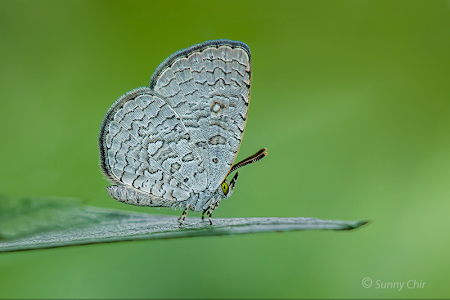 This female Apefly was photographed by ButterflyCircle member Sunny Chir. The species usually flies around restlessly but occasionally stops to rest on the top surfaces of leaves with its wings folded upright. On rare occasions, it is observed to open its wings partially to show its uppersides when sunbathing.